For the second time in my life I've run a half hour PR and been bitterly disappointed afterward. I'm glad I finished the marathon. I'm glad I ran it faster than any other marathon I've run before. I could have run faster. I just fucked it up. One would think I would have learned my lesson after road marathon #1. Then again after road marathon #2. But I didn't. 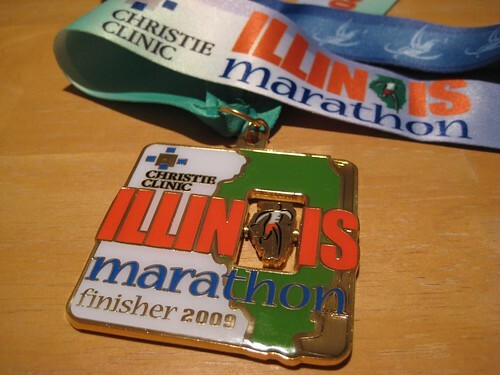 I started the Illinois marathon too fast, and as a result I finished rather spectacularly (and not the good kind of spectacular). 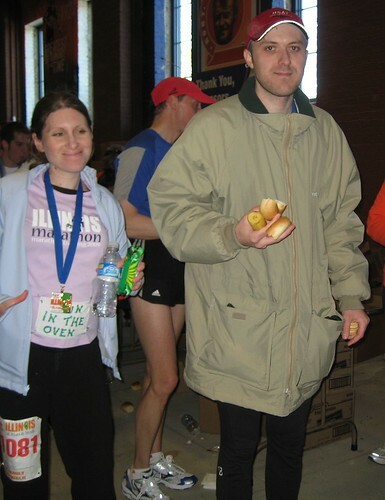 My goal for the race was 3:05, which I still believe was reasonable. However, in the back of my mind I thought there was a chance I could run 3:00, which was probably a bit of a stretch. So when I ran the first few miles on pace for a 3:00 finish I wasn't too worried. It felt easy. Really easy. It felt like I could run that pace all day. Sometimes the mind and the body don't always agree on these things. The first half of the race flew by. I was cranking out 6:50-6:55 miles like clockwork. 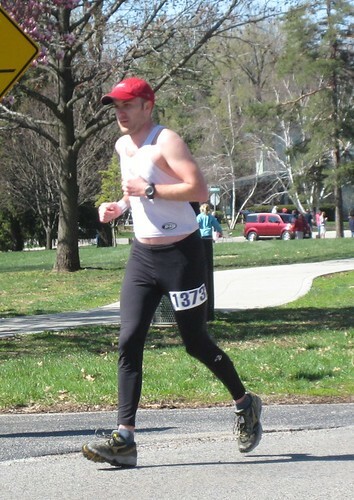 I ran a very steady pace and I was passing many runners who slowed significantly after the first few miles. I first saw my parents around mile 3 and I was feeling great. The course wound through Meadowbrook Park, through Urbana residential neighborhoods, and back to campus. I saw my parents again at mile 9 and I still felt great. 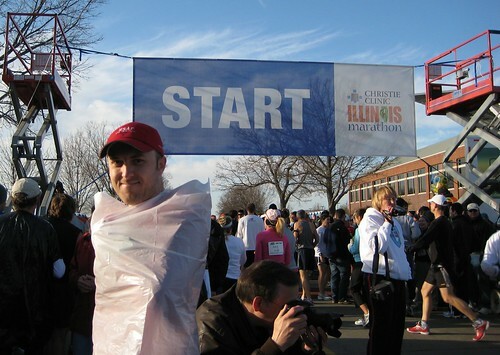 After crossing campus we ran through downtown Champaign where the half marathoners split off from the marathoners. Most of the runners around me turned off, though one guy I had been running with for six miles or so forged ahead. We ran side by side for over an hour, though never spoke a word to each other. Shortly after mile 11 we passed the Melissa's friends from the Anthropology department who were partying at a professor's house. Melissa, by this time finished with the 5K, wanted to be there by the time I passed but she hadn't quite made it yet. She was behind schedule and I was ahead of schedule. No matter. There would be other opportunities for her to watch. Around mile 12 the running was no longer easy. I still maintained my steady pace, but it was taking more and more effort. My thigh muscles started to hurt. This didn't happen in any of my training runs. At this point it set in that I had been running too fast, but I didn't slow down. I stubbornly continued. My anonymous friend and I passed the half marathon mark at 1:30:15. 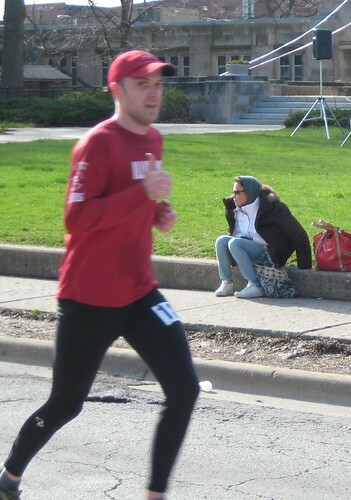 I had been planning/hoping to feel fresh at this point in the race, but I was far from fresh. I glanced at my heart rate monitor which read 180, well above my aerobic threshold. My muscles were consuming oxygen faster than my heart and lungs could supply it. The only way to overcome this deficit is to slow down. Significantly. Still on pace at mile 14, I began to struggle mentally. I knew I had no chance of maintaining this pace for the rest of the race. What would my fallback strategy be? 15 miles in I began to crack. I lost contact with my buddy as I slowed for the first time. Mile 16 was my slowest of the race so far... until mile 17... then until 18... I was on a downward spiral. My quads were screaming out in pain like nothing I had felt for years... perhaps since my last road marathon. Every step was painful. Around mile 18.5 one of my training partners, Chris, flew past me. We had similar abilities, training, & goals, but he ran a wise race while I did not. He tried to motivate me as he passed, but it was too late. I knew it wouldn't be much longer until the 3:10 pace group caught up with me. I hoped I could hold them off until mile 23 or so at which point I hoped maybe I could pull it together for the last 3 miles and tag along. 3:10 is my Boston Marathon qualifying time. I honestly thought I would have no trouble finishing under 3:10, but as the miles (slowly) passed it was looking less and less likely. 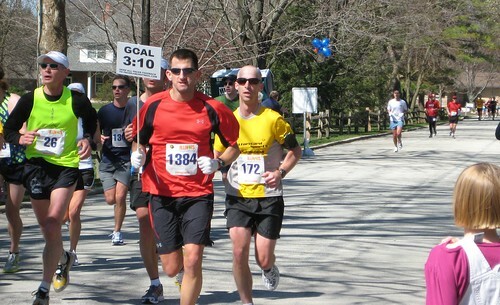 They finally passed me at mile 21 and I was unable to lift my pace even the slightest bit. This was the lowest point in the race for me. I felt like a complete failure. About a block later I had my biggest cheering section of the race. Melissa, friends, and family were there to cheer me on. I felt so terrible I couldn't even bear to look them in the eyes. Sorry guys, I know you were trying to help. Mile 21 was my slowest mile of the race. I didn't give another thought to my finishing time for the remainder of the race. I no longer cared. I was in agony, but I knew I just had to keep moving forward for just a few more miles. I walked through each aid station while drinking water & Gatorade. Drinking while running is not comfortable. On the other hand, the first few steps running at this point were excruciating. I was willing to live with the tradeoff. The last 2-3 miles I began to come back to life. I actually sped up a little bit. Many people were still passing me, but for the first time in 10 miles I passed other runners. I skipped the final aid station at mile 25. I felt like I was on a roll and I couldn't be bothered with slowing and/or stopping. The final mile down Pennsylvania Ave. felt like it was in slow motion. Once on Kirby Ave. I dodged some half marathoners as the two races re-merged. Then came the ramp down to the football field. It was steeper than I imagined and running down it killed my legs, but there was no stopping me at this point. 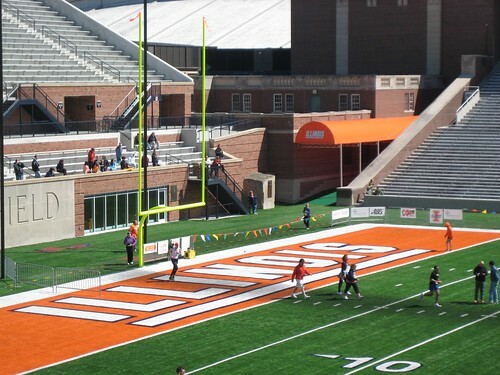 I ran a lap around the football field before lining up for the final drag into the finishing chute. 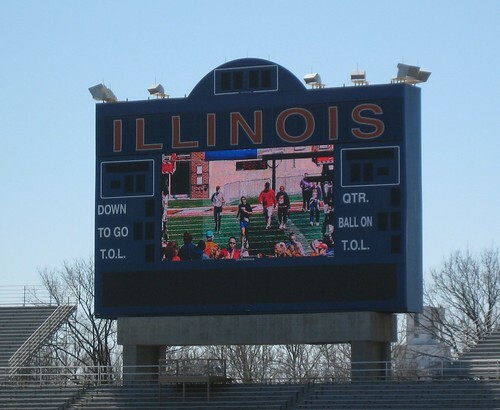 My image appeared on the scoreboard during those last few moments. I finished in 3:22:15, a half hour faster than my previous fastest marathon 6 years ago. Once I stopped running my muscles tightened up even worse. I was barely able to walk. I required assistance walking up the stairs off the football field. I was freezing cold after I stopped running so my dad gave me his coat to wear. Melissa & I grabbed a quick bite to eat before hobbling out to the parking lot to head home. The marathon was not pretty, and neither was the trip home. I think I've done a pretty decent job explaining many of the things that went horribly wrong for me in this race. But it certainly wasn't all bad. In the interest of ending on a high note I'll enumerate some of the good things. 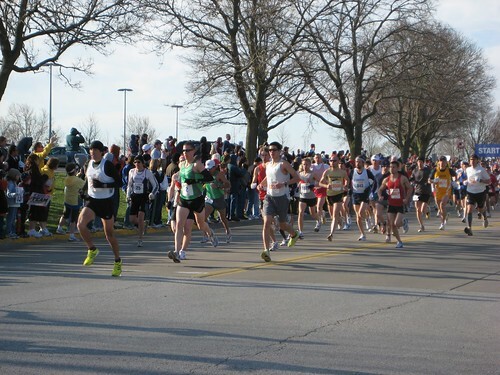 The race was very well organized, particularly for a first year event. My family and friends were very supportive of me. The crowds were great. The course was excellent. I trained very well and I was very physically prepared (though apparently not mentally). I did finish. I did get a half hour PR. 3:22 is a pretty good time for a marathon, even if I could run faster. So how long will it be before my next half hour PR? Congratulations! 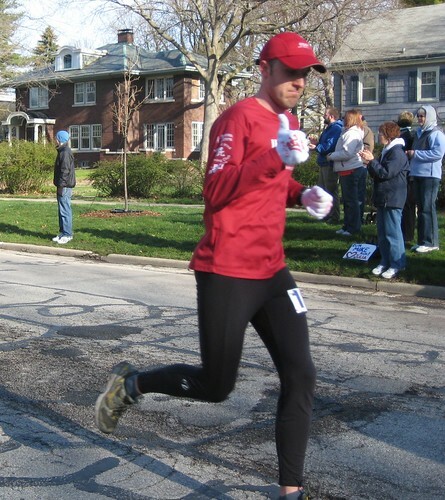 Even though you may not totally agree, the following are amazing feats: (1) committing to run a marathon, (2) showing up to run the previously-committed-to marathon, (3) finishing said marathon, (4) finishing in a personal best time, (5) finishing in a personal best time that's less than 7 hours. Ethan and I came to watch, but you were a little faster than our other target runner/walker. My heart is breaking for you. I'm sorry that I didn't get to see you until mile 21; I wish that I could do it over and be there for you throughout the whole thing. 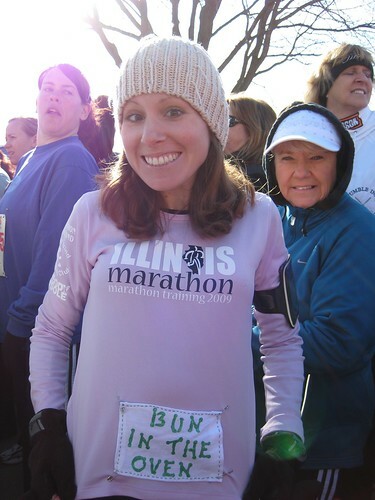 Marathons can be so unpredictable. You never know what's going to happen out there. In the 8 that I've run, 6 of them were exactly as you described (though without the 1/2 hour PR). But I guess that is why we keep coming back for more. Try not to beat yourself up about it too much. What you were able to accomplish was amazing! I was impressed, and one more 1/2 hour PB and you'll be qualified for the Boston. Maybe next year Ill get signed up for the 5k fun run. Will John be using cheese in next year's 5k?? It was great seeing you on the course, Rob. You ran really well. I'm happy for you. Don't be down. And I am absolutely thrilled for you and Melissa and the little runner to come. Thank you all for your kind words. I've definitely cheered up a bit in the time since the race. I'm still not thrilled, but I'm slowly getting over the disappointment. Thanks again!